The fantastic IQAir HealthPro Plus Air Purifier has won multiple awards and an impressive array of "best buy" placements from major reviewers. And for good reason - it combines four filtration technologies to remove air pollutants with what has been demonstrated to be incredible efficiency. The stats for this air purifier certainly sound very impressive:The HealthPro Plus is the world's first room air cleaner with filters that have been certified under the most stringent filter standard EN 1822 - and according to the manufacturer's brochure, the HealthPro Plus is the first air purifier ever to achieve a "zero" reading on a particle scanner test for escaping particles! 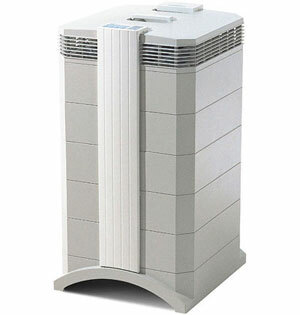 IQAir is a family-based company based in Switzerland that has been in the business of air purification since 1963. All IQAir air purifiers are made in Switzerland - and all their purifiers are individually tested and certified before leaving the factory. It's Swiss made! Switzerland is a country renowned the world over for its state-of-the-art precision engineering, which itself ought to say something about IQAir's engineering quality! IQAir states that the HealthPro Plus is effective against mold, dust, dust mites, pollen, VOCs, odors, smoke and general indoor air pollution - and claims an effectiveness of over 99.5% against viruses, bacteria, pet allergens, mold spores, dust and pollen. The HealthPro Plus is also certified to be 100% ozone free - producing no ozone whatsoever. Another impressive feature is the electronic control panel / system monitor - which lets you know how much filter life is left. IQAir has also made an ecological commitment - to restrict the use of certain hazardous substances from its products in accordance with European Union directives. IQAir has voluntarily made their air purifiers comply with directives which limit lead, cadmium, mercury, hexavalent chromium, polybrominated biphenyl (PBB) and polybrominated diphenyl ether (PBDE) flame retardants to agreed levels. We think the fact that IQAir is prepared to step up to the plate and voluntarily comply with new guidelines, speaks volumes about the company's positive attitude, environmental awareness and commitment to quality. Kudos! IQAir makes air purifiers used in hospitals worldwide - and were the only manufacturer deemed suitable by the Hong Kong Hospital Authority to provide air purifiers suitable to be used in the fight against the dreaded SARS! The well known publication Consumer's Digest gave the HealthPro plus a "Best Buy" rating and states that the HealthPro Plus is "ideal for allergy sufferers". IQAir is recommended by the American Lung Association and the HealthPro Plus is backed with a 5 year guarantee. Looking at reviews written by consumers online is often enlightening when it comes to separating company "hype" from what really happens when a product is used. Most of the users of the Healthpro Plus give it a 5 star review - although a few criticise the sizxe and noise of the machine (on high settings). Users seem to use the machine on low settings for "general" long-term use and only put on high settings when there is a particular air quality problem which needs rapid clearance. Users report amazement at how well the unit cleans the air and removes odors. Users with allergies and athsma report improved breathing. One user bought the HealthPro Plus within hours of a small house fire which had left a terrible smell of burnt plastic. Within an hour the house had been returned to "the best my place has smelled and felt in a long time". It rather sounds from the review as though they were originally planning to use the unit quickly and then return it... but they were sufficiently impressed that they decided to keep the unit. On reading IQAir's incredible statistics and accolades, off-grid.info/air-quality sure was impressed! It's a big unit, but the IQAir HealthPro Plus is right up there at the top of our shopping list.